Capilano University is cutting as many as 10 programs as the school faces an estimated $1.3 million shortfall in its upcoming budget. Capilano University is cutting several programs as the school faces an estimated $1.3 million shortfall in its upcoming budget. The school would not specify which departments are being cut, but said it amounted to about 200 courses from about 10 programs, including the Studio Art, Textiles, Software Design, Computer Science and Commerce. Marcus Bowcott, who has been teaching Studio Art at Capilano for two decades, says he found out on Tuesday that the program will be cut. "Not just the wind taken out of our sails, it was sort of like the sails got slashed," Bowcott told CBC News. "I'm sickened and I'm appalled. It strikes me as being utterly senseless." Under the proposed budget, students half-way through their programs will have the chance to finish. But after they graduate, the programs will be cut. A statement on the 2013-2014 budget posted to the university's website uses the term "suspended" to describe what is being done to some programs and courses. "Rather than do across-the-board cuts, which affect quality for every student, we are suspending intakes in some programs and reducing classes in some areas," the statement says. Interim Vice President, Academic and Provost Bill Gibson Gibson says the changes reflect the university's priorities. "We have to preserve the quality in what remains, and do less," he said. 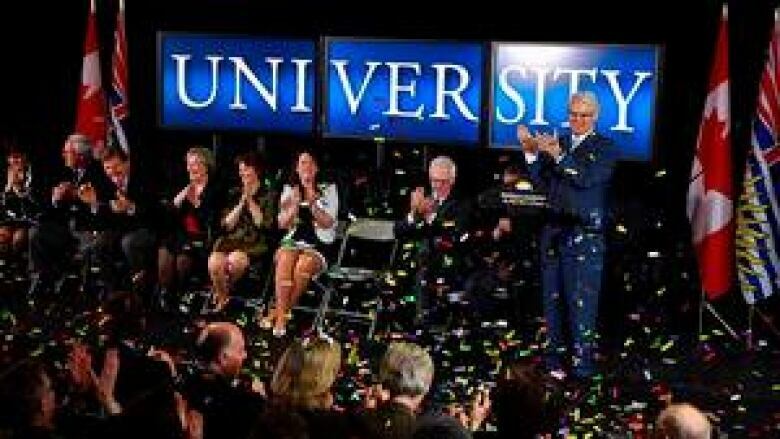 Gibson says the university has approached the province for more money and on Friday, some at the school blamed the B.C. Liberal Party for a lack of support. "It seems like the government is trying to centralize education into one institution. That doesn't really make sense because it's just going to create one way of thinking," said Juan Ciseros, a Studio Arts student at Capilano. "It's really an awesome place, you know. You don't find schools like this even in other countries either. It's it's really sad to see this happen." Some students have started collecting signatures on a petition, saying they won't let the programs end without a fight. "It's very one-on-one. Class sizes are small," said a tearful Melissa O'Connor. "It's a great environment to work in because people are there who want to be there and want to support everyone,"
On Saturday, the school will host the annual end-of-the-year Grad show, an event normally meant to showcase student projects. Students say they are planning a demonstration where they will cover their art with black sheets as a symbol of protest. The final budget will be approved on May 14 by the university's board of directors.